Spotify music can be an integral part of not only your own enjoyment while you are gaming or relaxing, but also provide some additional entertainment to your audience when you are streaming with Streamlabs OBS. You may directly add some free music to Streamlabs OBS. While for adding Spotify music to Stream OBS, you should have been notified that Spotify music has DRM policy that provides it from being used unauthorizedly. Thus, in order to connect Spotify to Streamlabs OBS, you should be well versed in some effective software solutions that will be mentioned here. Streamlabs OBS is free and reliable open broadcasting software for live streaming software. 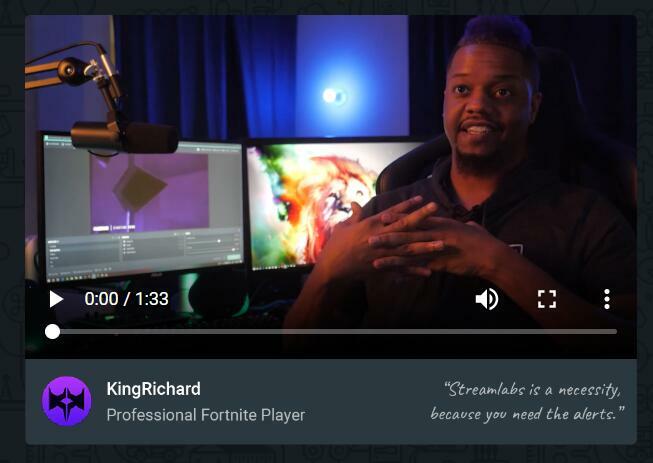 After you download Streamlabs OBS and install it on your PC, you can start your live stream in 60 seconds on Twitch, YouTube, or Mixer. Nowadays, online celebrity and live video streaming prevail on the web, becoming one of the most popular occupation. To be more welcomed and well-known, online celebrities need to make more vivid and impressive live videos. Streamlabs OBS would be one of the widely used programs. It can boost channel revenue by enabling viewers to trigger 3D animations on your face by donating. Besides, it saves 25% CPU and RAM by combining multiple windows like Streamlabs, Twitch Chat, Twitch Dashboard/Video, Streamlabs Dashboard, OBS etc. into a live view. To add Spotify to Streamlabs OBS will be a useful way to attract more audience and enrich the live video. It is so popular because of its easy installation and operation. For adding Spotify widget to Streamlabs OBS, you should know first how to add common music to it. Actually, it is very easy for even a layman to make it by following the simple steps. 1. 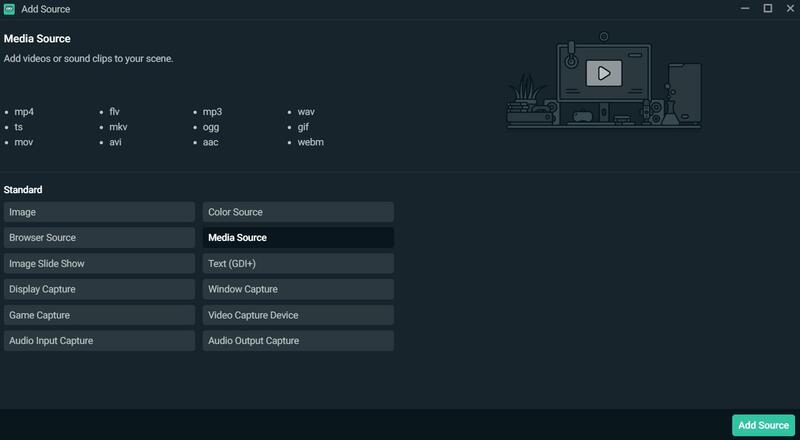 Run Streamlabs OBS, click the + icon under Sources to open Add Source menu. 3. A new window pop up, where you could name the music audio you will add. 4. Click Add New Source to browse and choose the music audio you like to add to the Streamlabs OBS. 5. Music audio will be added to the program immediately. However, when you are going to add Spotify to Streamlabs OBS, you should firstly notice that Spotify music is protected by DRM which doesn’t allow users to listen to Spotify music on other unauthorized devices or apps. In order to know how to add Spotify to Streamlabs OBS, at the very beginning, you should know how to remove DRM from Spotify music. And Leawo Music Recorder would be one of the popular ways that would do a great favor on how to add a Spotify extension to my Streamlabs OBS. 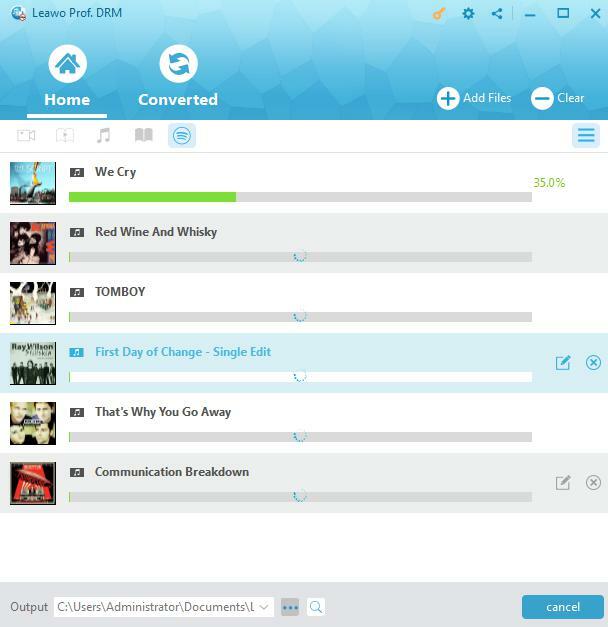 Leawo Music Recorder is an amazing but easy-to-use music recording software program that allows you to record your favorite music from any built-in input audio sources, computer audio and a number of online music sources, such as YouTube, Spotify, AOL Music, Last.fm, etc. and then save these recorded audio files in MP3 or WAV format with lossless quality. 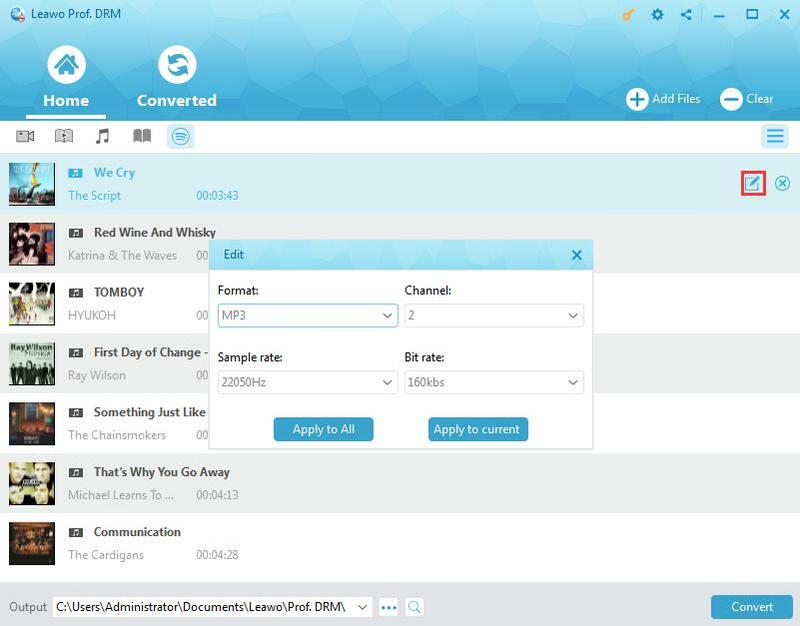 Definitely, you can use this recording software to record Spotify music and download Spotify music in the common MP3 or WAV as well. After downloading and installing Music Recorder on your computer, you could simply be of proficiency on how to add Spotify music to Streamlabs OBS after following the simple guide below to get DRM-free Spotify music on MP3. 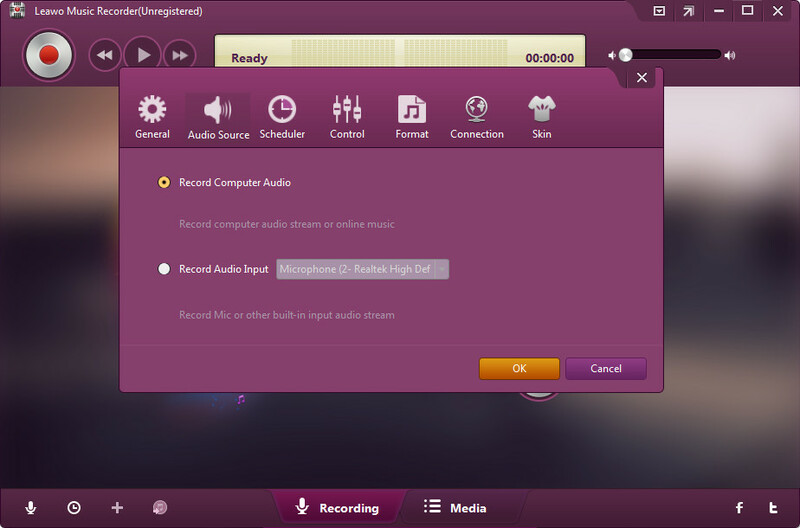 Step 1: Run the audio recorder on your PC to enter the recording main interface where you can click the “Audio Source” icon to choose “Record Computer Audio” option as audio source firstly to record Spotify music. Tips: To record audio from built-in input audio like Mic, you should choose “Record Audio Input” option. 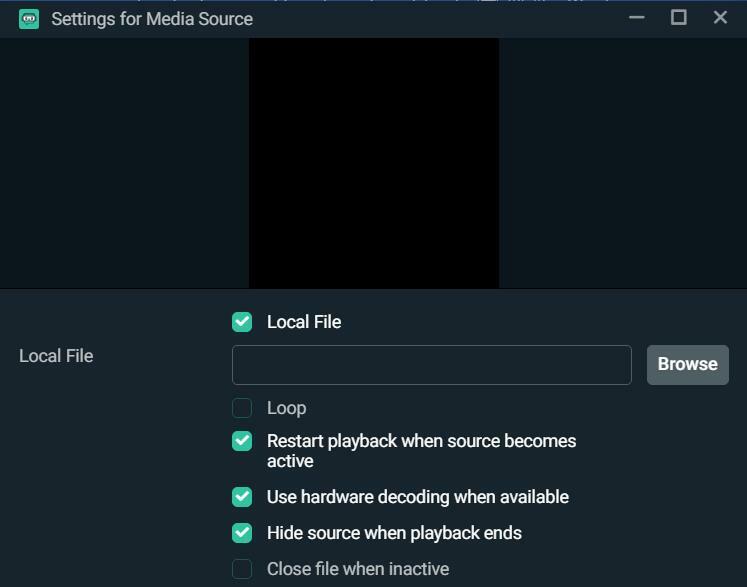 Next to Audio Source option, there are General option for choosing the output directory, Scheduler for setting the Start time and End time of the recording, Format option for setting the output audio format, etc. The output format is MP3 by default, if you like, you can choose WAV as the output format as well by clicking the drop-down list. After all setting is done, click OK and you will return to the main interface. Step 2. Click the red “Start” button to start recording. And then play your favorite song from Sportify. It should be noted that you’d better start recording before you play your music file to avoid content loss. In minutes, when the song is over, the recording software will automatically finish recording and download it with its original tags. 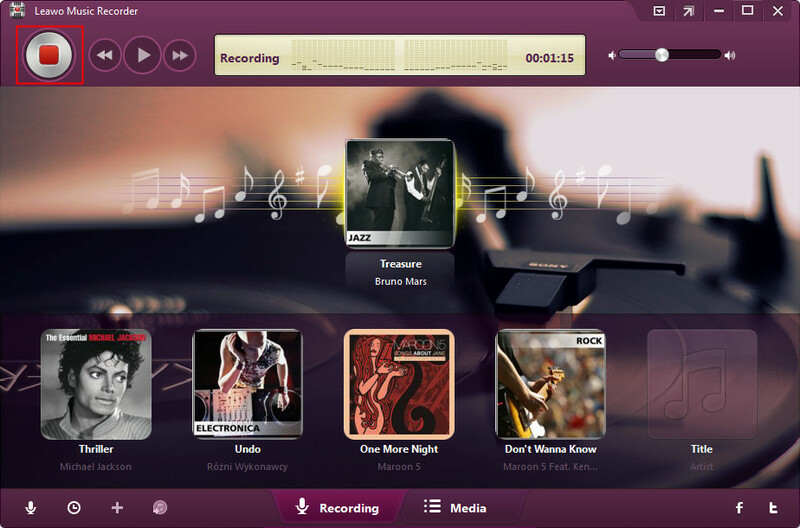 You can easily check or play the recorded music on Media panel of the program. Also, you can find the recorded music and follow the guide on how to show Spotify song on Streamlabs OBS. Except for music recording software, you are able to apply the best DRM removal software which can remove DRM from Spotify music as simply as it can. And Leawo Prof. DRM has been regarded as one of the most popular and powerful DRM removal programs, which is designed to remove DRM from iTunes videos(including movies/TV shows), iTunes music, Spotify music, Audible Audiobooks, eBooks, and convert them to popular DRM-free files for better entertainment. 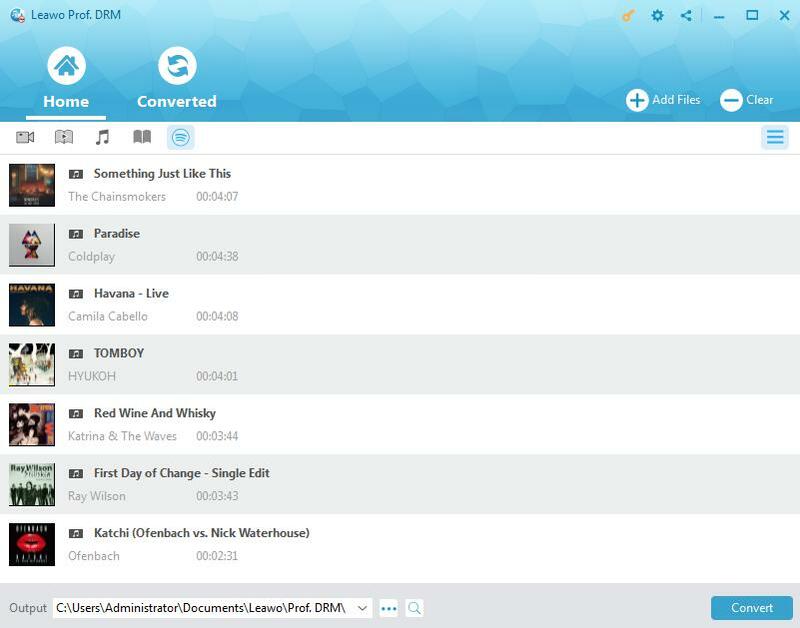 Besides, it can also convert Spotify music to the common music player compatible formats, such as MP3, M4B, M4A, AAC, WAV and FLAC with the 100% original quality reserved. Its stunning working speed and user-friendliness make the software prevail in DRM removal and conversion for most users. After installing Prof. DRM on your PC, you can now easily follow the simple steps to remove DRM and convert Spotify music to MP3 for feasibly adding Spotify widget to Streamlabs OBS. 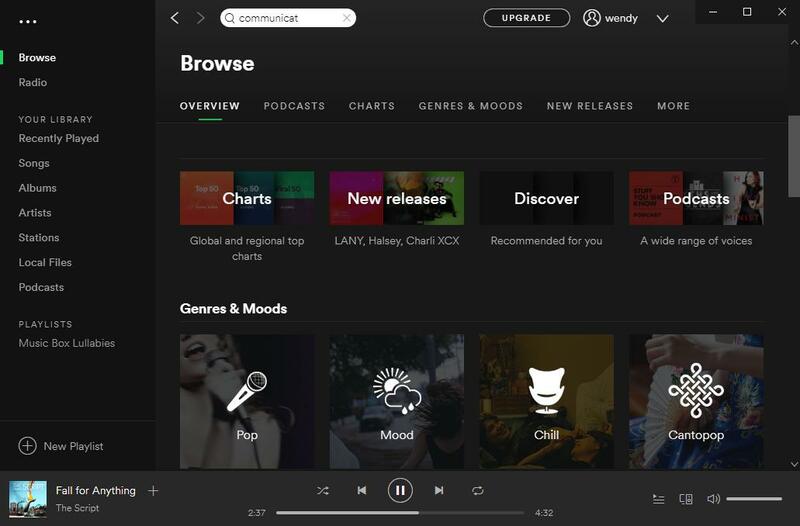 Tips: if you have installed Spotify on your PC, you should launch Spotify to make sure that it can play songs smoothly before you run Prof. DRM. Run Prof. DRM and then click the Spotify icon for adding the Spotify songs, albums or playlist to the program. 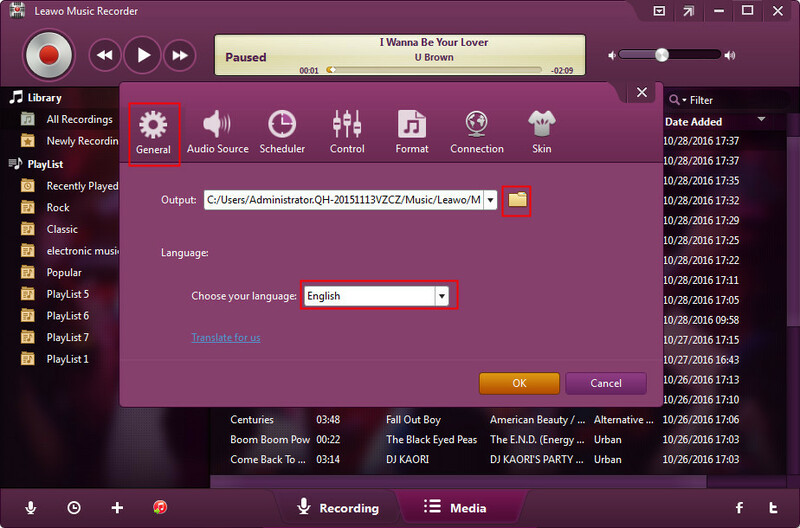 Besides, you can also directly drag your favorite songs, album or playlist and drop them to the program. 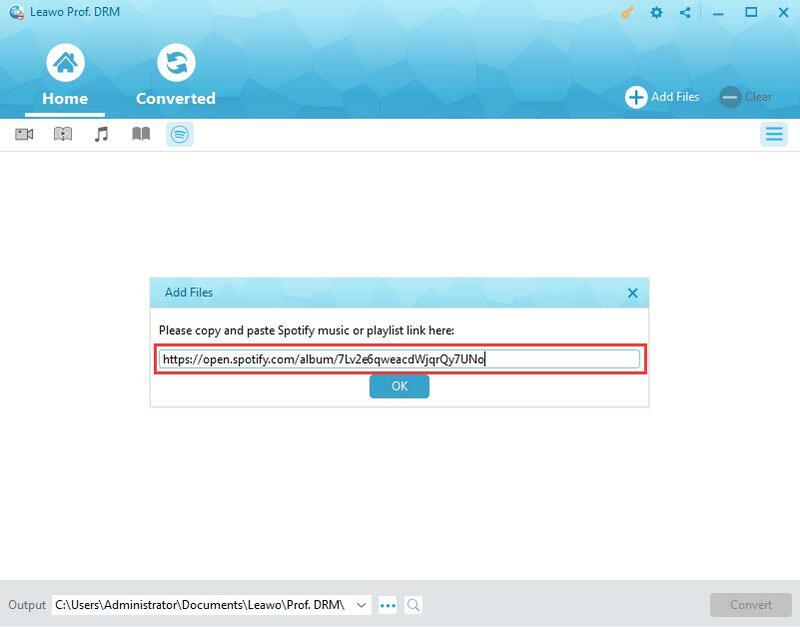 For Spotify Web users, you can add the Spotify music file by just copying and pasting the URL to the program for importing. When all songs imported from Spotify, you can choose any one of them and click the editing icon. An editing panel will pop up, where you can freely select MP3 as the output format and sample rate, bit rate, audio channel for output music files. Then, you can choose “Apply to All” or “Apply to current” for apply this setting for all the imported files or just the selected one. Go to the bottom of the interface, click the “…” button to select one output path to save the converted DRM-free files. 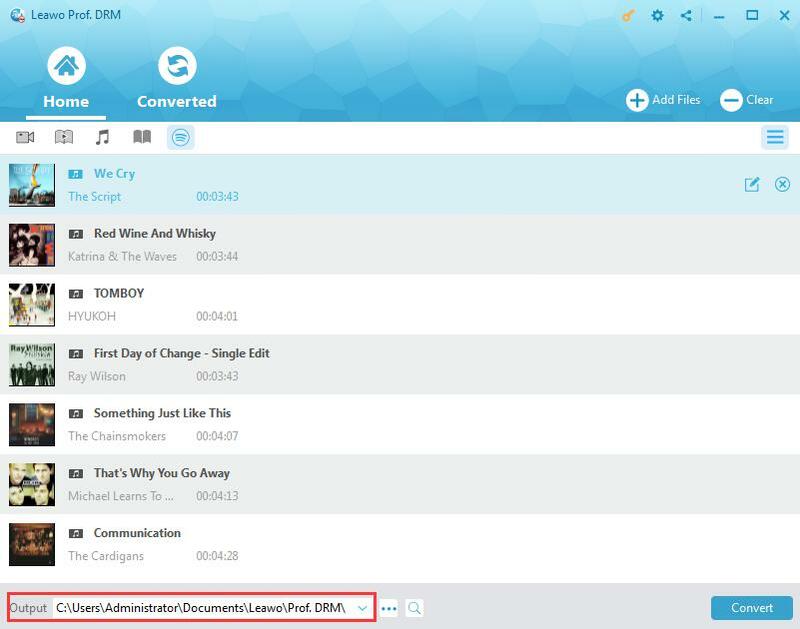 Click on the blue “Convert” button at the bottom right of the interface to start removing DRM on songs and save them as MP3 files. And then you can check the converted files by under “Converted” tab after a while. Now you have got the DRM-free Spotify music in MP3. For the sake of adding Spotify to Streamlabs OBS, you can feel free to import the converted music files you like to Streamlabs OBS simply. Now you must have known how to show Spotify song on Streamlabs OBS easily. The two solutions mentioned here can both deal with it effectively. If you would like to know which one would be better and more efficient for your own occasions, you can take a look at the comparison of them. Online Music, Computer Audio, Radio & Podcast, Audio from Mic, etc. MP4, MP3, M4A, AAC, WAV, FLAC. WMA, OGG, MKA, AC3, epub, mobi and so on. Anyway, the two programs are excellent on how to add a Spotify extension to my Streamlabs OBS. If you are in an urgent situation to connect Spotify to Streamlabs OBS, you’d better use Prof. DRM which works faster than the recording software. It can also import iTunes music to Spotify and import Spotify music to any other music players if you need. Someone may ask how to add a Spotify extension to my Streamlabs OBS, this problem can be solved as well with the two solutions mentioned here. Since you have downloaded Spotify music free of DRM, you don’t have to try adding Spotify widget to Streamlabs OBS at all. You don’t need worry about how to setup Spotify on OBS Streamlabs, either. The DRM-free Spotify music can be easily added to Streamlabs OBS and tell you how to show Spotify song on Streamlabs OBS as simply as possible.